Everyone knows that boiling water kills the “stuff” in it. But how long should you boil it? Before preparing this post, we boiled it for 20 minutes. We had read it somewhere and we faithfully boiled away – for the past 5 years. But we were wrong. 20 minutes is excessive. 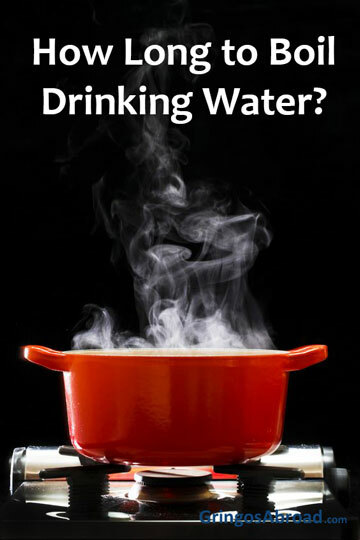 How Long Do I Have to Boil Drinking Water? Not all boiled water is the same. Boiling water for tea is one thing. Boiling it to remove bacteria, amobeas and other pathogens is something else entirely. You need a rolling boil for 1 minute to kill the little bugs for elevations under 2000 meters (6,562 feet) altitude. Live above this altitude and you’ll need to increase this to 3 minutes. While we generally filter our water we use tap water for cooking. Until recently we were only using tap water if it would be on the stove for 20 minutes or more – as we obediently followed the imaginary 20-minute boiling rule. Now we don’t use any filtered water for cooking. Organic contamination: protozoa, bacteria, viruses. Boiling water can eliminate these contaminants Well, they aren’t actually eliminated – they just die. You will end up consuming and digesting them but they won’t cause you harm, if the water is boiled correctly. Toxic contamination: chemical contamination such as pesticide / herbicides, pollution and chemical spills. No amount of boiling will remove these contaminants. You’ll have to filter or choose another water source. It’s not that all water abroad is bad (although the U.S. Environmental Protection Agency reports that 90% of the world’s water is contaminated). It’s just that it is different from home. Locals seldom have trouble with their water supply. Visitors can get sick from water that locals drink regularly. At home (in Ecuador’s Andes mountains) we use a water filter. It is a six stage, 4 gallon filter that provides enough water for our family of three. The primary filter stage is the micro-ceramic dome. This traps and filters dirt, debris, contaminants (such as pesticides and herbicides) and bacteria. Read our full water filter review. When we are on the road, we buy bottled water, juice or soda. If we are at a restaurant, we generally order bottled water or hot drinks. Based on the rule of a one-minute-boil most tea and coffee should be safe. Some short term travelers and new expats like to live-like-a-local. We did too – for a while. And during that time, we all got parasites and amoebas – multiple times. I had food poisoning and had to be hospitalized. Now we are more responsible. If you’ve ever traveled with stomach problems you know that it’s worth avoiding. As we were planning our move to Ecuador we didn’t really know what to expect. We bought a UV water sterilizer pen and a 2 part chlorine mix. Although these are great tools for back-country backpackers and jungle explorers they are not necessary for travelers living in an established town or city – at least not anywhere we’ve been. As I was writing this post, I discovered a couple of products that are now on my wish list. I want the first item for my backpack and the second item for a backup house system. Lifestraw Personal Water Filter: Filters up to 1000 liters of water without chemicals. Works on the same principle as the ceramic filter – by not allowing pathogens to pass through the microscopic holes. Katadyn Pocket water microfilter: This is a more serious piece of equipment. It will filter 50,000 liters and the filter comes out so it can be cleaned. The pump will output 1 liter per minute and it weighs just 550 grams. Is all boiled water the same? No! Learn about boiling water for pasta, boiled eggs, and more. How to Boil Water. You just heat the water until it starts bubbling. How do you handle drinking water while abroad? Do you buy bottled, boil or just drink from the tap? I didn’t read all of the posts but in case no one posted this you should know that neither of the filters mentioned above eliminate viruses. The Life Straw family will but not the regular little Life Straw. Question in mind that what about vitamins & minerals essential after the boiling point of the water ? Booking for pathogens and boiling for other things are different, is this correct. Please do correct me if I’m wrong but it seems you may be taking the twenty minute boiling thing from removing chlorine and chloramine. I do agree with the post and a very useful information on making the precious commodity healthy . water quality varies from place to place in terms of its mineral content, organic and inorganic contaminants . Boiling water for few minutes is one of the preliminary and basic steps for making it free of many contaminants. While we do not yet live in beautiful Ecuador yet, (still in planning stages) you columns and advice are much appreciated. The was one area that we never really looked at in any great depth. And to whom it may concern, Bryan did not say that he agreed with the 212 F, or the start seeing bubbles thing. He said that they were some of his favorites from the google page. And being my dad, I know that means he thought they were comical and ridiculous. Seeing bubbles does not mean the water reached 212 F. In Cotacachi the water bubboils at 199 degrees and so, a perfectly soft-boiled egg takes ten minutes to cook at this altitude without added pressure. Soft-boiled eggs are called three minute eggs by foodies like me but at this particular altitude it takes ten minutes at a rolling “boil”. So if you do the math, you need to adjust for your baking as well as simply your rice. This altitude factor is particularly important when cooking foods which contain natural antinutrients and other natural toxic chemicals, particularly beans, potatoes, and yuca. Many dangerous plant toxins, especially in “heirloom” or ancestral varieties, can only be neutralized by temperatures literally over 212 and that does not mean “seeing bubbles”. In Cotacachi I help our new residents with market tours and cooking classes about altitude adjustment and about the nutraceutical properties (pluses and minuses) of local foods. I think it’s good to know these details. Bryan, I have to say, your post made me smile. Very impressed with this balanced overview. You are definitely right – the quality of water around the country certainly varies, and newcomers cannot just assume that it is safe for drinking. We drank bottled water in Banos, Cuenca, mostly because we didn’t like the taste of the tap water. On the coast, nobody, not even locals, drink the water because it just is not potable. Everyone gets their water delivered. Now, we are in Pifo, near Quito, where the government has recently upgraded their water treatment system, and the water has been pronounced “safe” and tastes good as well. As opposed to the coastal area and Cuenca, big blue jugs of water are just not seen here commonly. But I still prefer to drink my water as herbal tea here, mostly because I enjoy the security of boiling it a bit, and also, it’s cooler in the highlands. Thanks for the informative article! Good article. I laughed when I saw that you had a UV pen. I spent $100 on one before coming to Ecuador 5 years ago and haven’t used it once. However, in an emergency?? Water in Quito never reaches the 212 F boiling point; hence, the need to boil longer. For what it’s worth (not a whole lot I suppose) I’ve lived here in Cuenca for about 3-1/2 years now and have yet to boil the first drop of any drinking water. Tea and coffee water yes, but for just a few seconds. My ice maker is also connected directly to the cold water system. I realize that your advice is appropriate for many areas, but don’t believe it “holds water” here in Cuenca. Thanks for your comment Terry. You are right that there are differing qualities of water around the country. This post is meant to give an overview of boiling water – and what we’ve learned. This information is useful for travelers and expats who will be visiting cities and attractions across Ecuador and South America. I’m not sure if you know, but there are many water systems within the area of Cuenca. We lived on the Baños water system a few years ago and it was not good. We are pretty sure that this is how we got parasites. Saying that “Cuenca water” is all safe is a little broad. Areas within the city – still considered to be part of Cuenca have old and unsafe systems. Another area that I know isn’t good is Racar. It is a few kilometers up from a top gringo area and many local residents won’t drink it.